In this example, the day boolean is set to true. At the above image, the day boolean is set to false. The code should be self explanatory. Basically, the boolean day is created and initialized (line 7). Then, the first toggle is rendered, just as described on the official documentation (line 12). The second toggle, the one labeled “Night”, is rendered just as the previous one, but with a couple of differences. The inverted (note the ! sign) value of the day boolean is passed as the first parameter to the GUILayout.Toggle() method. 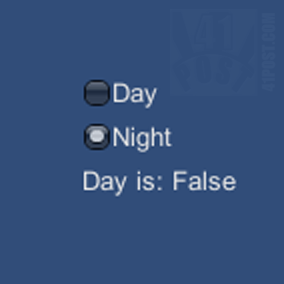 This makes the toggle render the correct state, which is the inverse of the day variable value. Additionally, the value of the boolean returned by the GUILayout.Toggle() method is inverted (again, notice the ! sign). It makes the GUILayout.Toggle() method return the correct boolean value, which is stored in the day boolean. 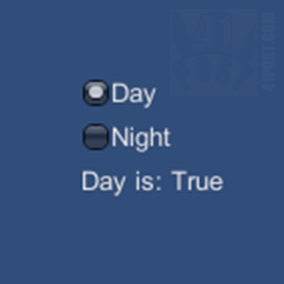 In other words, when the “Night” toggle is selected, the day should be set to false.